How is a wrist arthrodesis procedure performed? What kind of incision does a wrist arthrodesis procedure require? Will the removal of bone from the iliac crest not result in a lack of bone in the pelvis? Is the removal of bone material from the iliac crest unavoidable? Is there a lot of bleeding involved in this procedure? In the majority of cases a plate is placed in between radius, carpal and metacarpus bone. Plates used for total fusion of the wrist are constructed very similar to those used to treat bone fractures. The current plates used for wrist arthrodesis procedures typically are pre-bend in such fashion to allow for perfect functional positioning of the fusion after setting the plate in place. The plate may either be attached to the second or third metacarpal bone of the hand. Proximal it is always attached to the radius. X-ray following a wrist arthrodesis procedure involving a plate. The image shows the performance of an arthrodesis with the help of a plate. Wrist arthrodesis procedure using a plate specifically manufactured for the procedure. 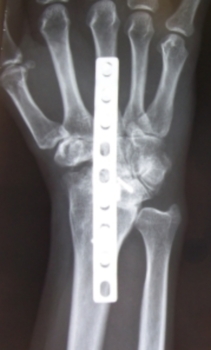 The image shows a wrist arthrodesis procedure on an x-ray image. It was taken from a lateral position. Please note the screws and the position of the plate. With the help of this plate the wrist will be fused in a slightly extended position (approximately 10°). During surgery the damaged layers of cartilage of the carpal bone and radius will be removed. The cavities usually will be filled with a larger bone graft taken from the iliac crest. Over a period of several months there will be a fusion between radius, carpal and metacarpal bone. The wrist becomes rigid. Surgery wound evidentiating the cut just a few days after a wrist arthrodesis procedure. 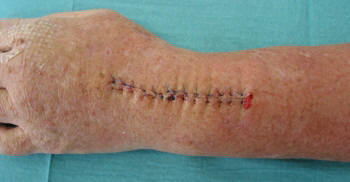 The image shows the surgical wound on day five after a wrist arthrodesis procedure. The drainage has already been removed. There will be an additional surgical wound right above the iliac crest since many wrist arthrodesis procedures use bone stemming from there. No. The iliac crest holds a considerable amount of bone in each person which can be spared without any noteworthy disadvantage. As a consequence of the aforementioned bone removal there will be a scar of approximately five to ten centimeters and many times also a slight indentation in the bone which over the years will more and more fill up again. The bone tissue removed from the iliac crest is necessary in order to fill up the gap between the individual bones with endogenous bone tissue. After that, Mother Nature – over a course of many months and even years – will produce a solid bone graft formed of radius, carpal and metacarpal bones. No. Not in every case. However, using bone grafts from the iliac crest does speed up the fusion process associated with the arthrodesis considerably and also makes for a more reliable result. Five day old scar at the lateral pelvis after performed bone graft harvesting for a wrist arthrodesis procedure. 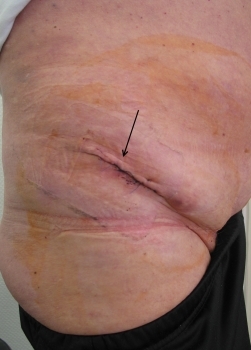 The image shows a five day old scar at the lateral pelvis after removal of bone tissue used for a wrist arthrodesis procedure. On the other hand it is possible to abstain from using bone graft from the iliac crest in certain cases. Smaller gaps may be filled in with bone material taken from the radius. The disadvantage of this approach is that it will take longer for the fusion process to be complete. The advantage however is that particularly patients with serious other conditions may benefit from avoiding a second surgery thus avoiding additional potential anesthesia side effects/complications. No. The loss of blood associated with a wrist arthrodesis procedure is usually very moderate, since the surgery takes place on a bloodless operating surface. That means a cuff is placed to the upper arm obstructing the blood flow to the hand. This will allow the surgeon to clearly visualize all fine structures within the wrist; the patient loses considerably less blood using this approach vs. not working with a cuff. Removing bone graft from the iliac crest may result in slightly larger blood losses, even though in most cases the blood losses to the pelvis remain moderate as well. Substantial blood losses may only be expected in case of secondary hemorrhaging!